Commanders are also encouraging service members to lobby against Senator Gillibrand’s bill. As Congress debates an overhaul of the military justice system to stem an epidemic of sexual assault, the armed forces are struggling to conceal their own internal divisions over the scope of reform. According to a senior officer who spoke with The Nation, the military is actively encouraging service members to lobby against legislation that would curb commanders’ authority over the prosecution of sexual assault cases, while suppressing pro-reform voices within the ranks. At issue is a proposed change to the military justice system to give military lawyers, rather than commanding officers, the power to determine whether accusations of a serious crime warrant a trial. The Senate is divided over the proposal (introduced by Senator Kirsten Gillibrand and known as the Military Justice Improvement Act, or MJIA), one of several reforms being considered. 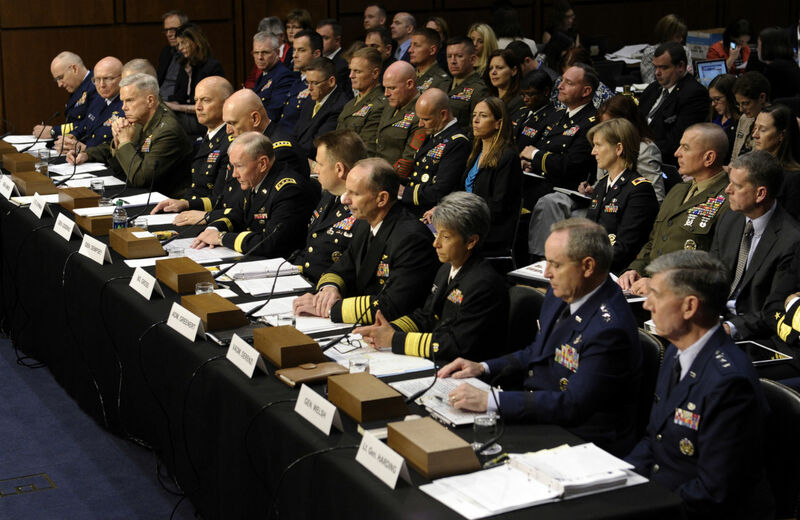 Survivors’ advocates say MJIA is critical to shield victims from retaliation, but it has elicited total opposition from the top brass, who argue that commanders’ authority to convene a court-martial is essential to their ability to maintain good order and discipline. The JAG’s account raises the question of whether Congress has heard a representative range of military opinions as it considers historic reforms. According to the JAG, perspectives on taking prosecutions out of the chain of command are decidedly more mixed within the ranks than the brass’ testimony would suggest. As a result, he believes, the debate in Congress has been skewed. Already, a number of retired generals, veterans groups and the DOD’s own advisory committee on women in the services have recommended removing the decision to prosecute serious crimes from the chain of command. That has left the top brass scrambling to maintain the impression of unified opposition. That leaves only outside advocates and retired officers to challenge statements made by top brass, many of which have been misleading, the JAG believes. He pointed to the claim, made repeatedly by the Pentagon and Gillibrand’s opponents in the Senate, that convening authority is critical to a commander’s ability to enforce good order and discipline within the ranks. But convening authority is not always a function of command; although all commanders are responsible for good order and discipline, many already lack the power to take serious criminal cases to court martial. Commanders’ lack of legal experience also leaves victims and anyone falsely accused of a crime vulnerable. “We would never expect somebody who is getting medical treatment to ask your commander what kind of treatment they should get, or give commanders the authority to tell them what kind of medical treatment they get, because it’s just ludicrous. Yet when it comes to our area of expertise, the justice system, we defer to commanders in making these decisions. It makes no sense,” the JAG said. McCaskill is one of the most prominent opponents of MJIA, along with fellow Democrat and Armed Services Chairman Carl Levin, and Republicans Kelly Ayotte and Lindsey Graham. Gillibrand’s amendment is likely to draw a filibuster, meaning she’ll need fifty-nine supporters. So far forty-seven of her colleague have committed, including eight Republicans. Both sides are engaged in an intense campaign to win over some thirty undecided senators. McCaskill and Ayotte have argued that “the victim community is not monolithic” in its support for MJIA. That may be true, but it appears neither is the military in its opposition. Zoë Carpenter on how the VA is discriminating against thousands of victims of military sexual trauma.